In the glass this Merlot shows a slightly paler purple than I was expecting. The nose, after I performed the ‘Shake‘ exhibits gorgeous black berry and cinnamon notes. On the palate I am greeted with a really smooth dose of Ribena, some meaty notes, and a fresh ensemble of tannins that are ever present but not cloying. The wine is full flavored, make no mistake- but it does so with a very gentle build-up. Extraction is at its fullest and with that comes a well hidden 14.5% alcohol. The mid palate is somewhat muted after the initial uptake, the finish is where it’s at. More dark berries emerge as well as a blueberry pie component. I hate to say it, but this wine needs a touch more oak. Yup, I said it. Not lashings, but a tiny more vanilla, perhaps a little more tannic bite. At one point I’m sure the wine had plenty of it, perhaps just fading at this point. The structure is good though and the wine is balanced. I would drink up as the wine is at peak and there is not much in the way of tertiary flavors. It is relatively easy-going and will do well with a variety of dishes. I am going with 90 points and 4 stars for this $28 effort. Salut…. Gold, but a lighter shade. It looks waxy when I swirl the glass, which bodes well for a dessert wine. On the nose it is sublime- apricots, honey, candied pineapple. On the palate this wine is super smooth, somewhat oily in texture and really delicious. I get yellow stone fruits- apricots, peach jam and some honey on the initial attack. The mid palate is silky but I just realized I sense no acidity whatsoever. Glycerin comes to mind when trying to describe the texture I feel on the mid palate. The finish is somewhat dry with a hint of tannins and now I see the emergence of some acidity. Well played Mr. Winemaker, it all comes together right at the end and makes sense. The finish has great fruit notes- in addition to the apricots, there are some almond hints, orange zest and a pineapple streak. Lovely. This is a generous dessert wine that has a nice unctuous texture, plenty of fruit, a nice mouthfeel and the ability to age for decades. It is young but really enjoyable now. Drink till 2035 easily. 95 points. I paid $28 for a half bottle – 5 stars. It was my dessert after grilling the most massive Tomahawk steaks ever. Salut…. A friend of mine just brought this from Croatia. He loved the winery and enjoyed their wines, so I got the spoils! It travelled 3/4 of the way around the world before I let it sit for a week to settle down. The varietal, Plavac Mali is found predominantly in Croatia and is a distant relative to Zinfandel. It is tannic, high in alcohol and produces rich wines. This one is see-through, light purple, almost a touch orange. Delightful nose of black currants, cranberry and green peepers. The initial taste is interesting to say the least: upfront tannins and a dose of blue fruits with some licorice. The dryness of the tannins carries on throughout and is the finale. On the mid palate more red than blue fruits but I also get some acidity interlaced with the tannins. The finish is all tannins, with just a hint of blueberry. This wine would rock some minced meat kebabs, perhaps a grilled lamb chop too. 89 points for this delicious wine. The 14.5% alcohol is hidden well and the structure is solid here. I couldn’t find much info on pricing, but one place in Europe used to sell it for 28 Euros. That would make this a 3 star effort. Salut…. It’s pasta night and I need a Sangiovese. This one happens to be ready to go on my daily drinking shelf and I am excited. In the glass, the color is a pale, see through reddish purple- reminiscent of Pinot Noir. On the nose, strawberry and cherry, just like Pinot. The palate introduces me to delicious strawberry and capsicum flavors, but I get a dose of heat right away. A quick glance reveals a 14.5% lurker here. The wine transitions on the mid palate to more strawberries and a red raspberry jam. The alcohol still permeates though and I am not sensing much in the way of tannins, until the very end. The finish is where they appear, very well integrated but lacking a good dose of acidity, just more heat. The wine is delicious, yet unbalanced and I fear it will not hold out well in the cellar, which is a shame as I would love to revisit this one in 10 years. 88 points, the structure and excessive alcohol being detractors. I really do enjoy the flavors though. For $28 it is a 2 star wine for me. Salut…. This wine is 15 years old, yet it pours like an infant- dark purple, no bricking and clear, if not see-through. The nose is gorgeous, fruity yet nuanced with secondary flavors belying maturity. Plums, coffee, tobacco and leather come to mind. On the palate, rich plums, cassis and a touch of eucalyptus. This wine is not even close to maturity. Tannins are on pointe and there is a juiciness to the mid palate that I am enjoying thoroughly. The finish leaves you with a clear dose of acidity, the tannins drying up at this stage. There is still tons of primal fruit here and the wine already demonstrated its ability to pick up those long sought after nuances of aged Cabernet. This is a top wine in my opinion, worthy of 92 points even at this stage of its development, which is funny considering it only got 83 points from WE back in 2006. Drink now till 2021 at the least. Pair with any beef dish, charcuterie or just by itself. I found it online for $28. 5 Stars. Salut…. If you read much of my blogging you will know that I love this varietal. 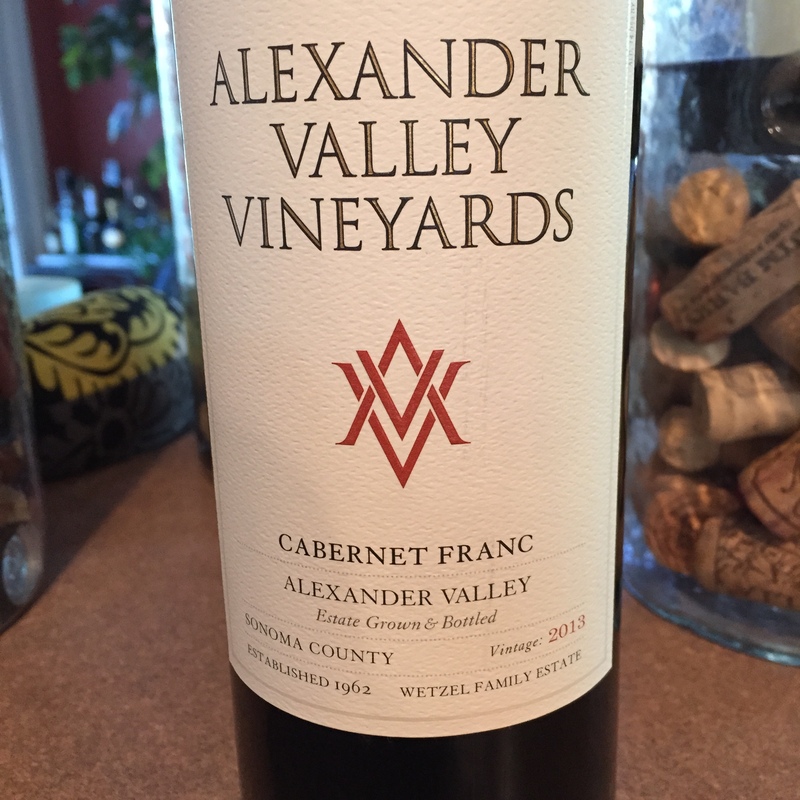 It exudes a softer sexier side to the Cabernet grape while showing off floral notes. This winery is where my son and I took a tour when we were in the Valley this past Spring. The wine is a crimson purple and has a stunning nose of blackberry and chocolate with some violet hints. Super smooth introduction of black and blue berries with a smidgen of oak and a tasty coating of lithe tannins. The mid palate is dark and brooding whilst the finish is decently long and caressing with tannic dryness and a touch of acidity. This is a super delicious wine which technically gets 91 points from me, bravo. 2015-2022. $28 make it a 4 star effort in my books. Salut…. This French appellation has always appealed to me for it’s softer flavors and more rounded mouthfeel. 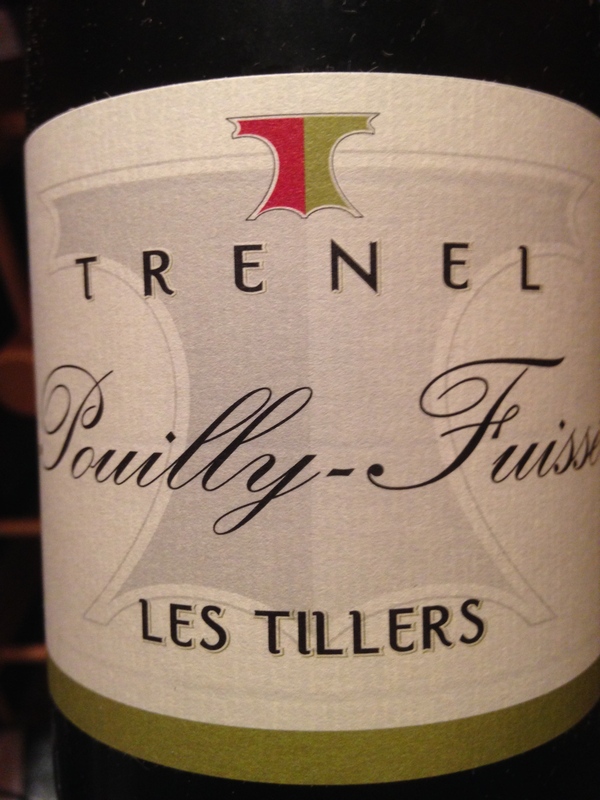 I enjoy steely Chardonnays, mineral edged ones, buttery versions and even over-oaked Cali offerings, yet Pouilly-Fuise is consistently the one style that both Moxie and I enjoy the most. The pale golden color was a good introduction. Pears, apples and green melon on the nose gave an inkling of what lay ahead. A smooth entry with tart yellow apples, citrus, flint, butterscotch and a touch of clove were really confusing my overloaded palate. I wasn’t expecting such a myriad of flavors! A long finish with balance made me really like this wine, 90 points. Turkey, oysters and salmon would pair perfectly with it. $28 and 4 stars for this Burgundian beauty. Salut….